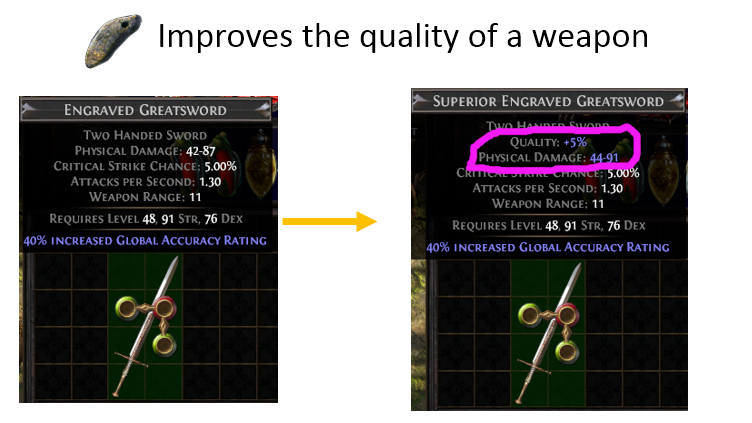 How to increase the quality of weapons? 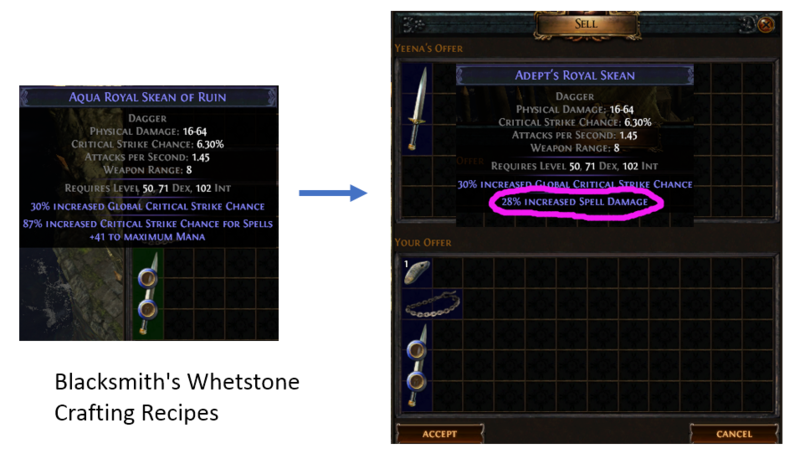 Blacksmith’s Whetstone is the currency that can be used to upgrade the quality of a weapon. Specifically, one piece of Blacksmith’s Whetstone improves Normal weapon by 5%, Magic by 2%, Rare by 1%, and Unique by 1%. Quality 20% is the maximum. In addition to improving quality, the value of physical damage has increased as well. In order to apply it, right-click Blacksmith’s Whetstone then left-click a weapon. (2) Using Blacksmith’s Whetstone recipes is also an effective strategy. (3) Purchase from the vendor, such as Greust(The Forest Encampment, Act 2) exchange one Blacksmith’s Whetstone for 3 Armourer’s Scraps. (5) Buy 200 Blacksmith’s Whetstone for $0.22 additional 3% off with coupon “AOE”. While playing the game at the low level, one can apply the recipe to farm Blacksmith’s Whetstone. 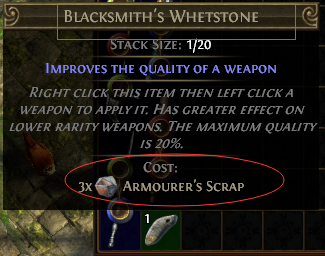 Any weapon with quality 20% can vendor for one Blacksmith’s Whetstone. Whereas, multiple weapons would be at least 40% quality. Greust in The Forest Encampment in Act 2, sell a Blacksmith’s Whetstone for 3 Armourer’s Scraps. When stash stock having lots of Armourer’s Scraps, one may apply for it. One can exchange a Blacksmith’s Whetstone for 4 Scrolls of Wisdom to any vendor. However, this is the downgrade recipe and always not recommended. Weapon may be any rarity, recipe always makes magic (Blue) item. The rarity and ilevel of the Rustic Sash determine the % roll: Magic (Blue) the “Heavy” mod (40-49%) and rare (Yellow) the “Serrated” mod (50-69%). Weapon may be any rarity, recipe always makes magic (Blue) item. The rarity and ilevel of the Chain Belt determine the % roll: Magic (Blue) the “Apprentice’s” mod (10-19%) and rare (Yellow) the “Adept’s” mod (20-29%). 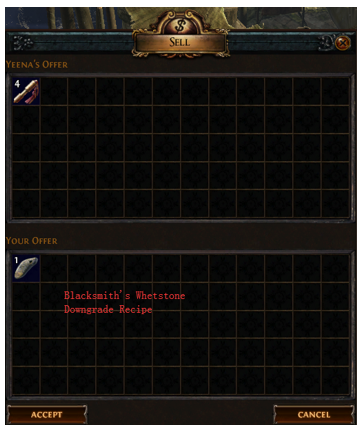 There is no guaranteed divination card to obtain Blacksmith’s Whetstone. The Sharpened Blade is a prophecy that rewards one piece of Blacksmith Whetstone. Blacksmith’s Whetstone is also a useful resource for exchange other currency. Greust(The Forest Encampment, Act 2) in exchange a Glassblower’s Bauble for 8 Blacksmith’s Whetstone. Tarkleigh(Lioneye’s Watch, Act 1) sell an Armourer’s Scrap for one Blacksmith’s Whetstone. 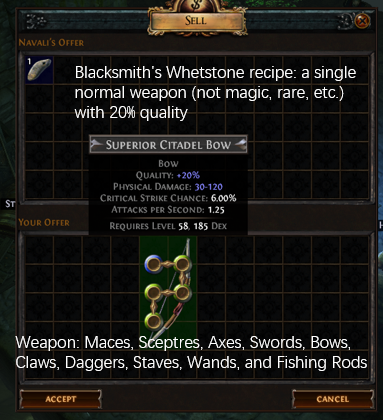 At present, one can trade 200 Blacksmith’s Whetstone for one Chaos Orb with other players. Need thousands of Blacksmith’s Whetstone? Buy 1,000 Blacksmith’s Whetstone for $1.1 extra 3% off with coupon “AOE”.